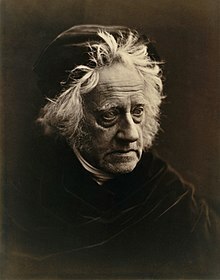 Sir John Frederick William Herschel, 1st Baronet, KH, FRS (7 Mairch 1792 – 11 Mey 1871) wis an Inglis mathematician, astronomer, chemist, an experimental photographer/inventor, who in some years an aa did valuable botanical wirk. ↑ 1.0 1.1 "Herschel, Sir John Frederick William, 1792-1871, astronomer". NAHSTE project. University of Edinburgh. This page wis last eeditit on 30 Juin 2018, at 21:53.